McMurray Musings: What's Your Three, Wood Buffalo? When the invitation to join the committee arrived in my email inbox I was intrigued. A movement to encourage people in our community to do good things – small things perhaps, but good nonetheless – through a campaign built by members of our community? Of course I went, which is how my involvement with a large purple 3 began. 3 Things for Wood Buffalo is based on a movement in Calgary. It is a simple concept: develop a grassroots movement to encourage people to do three things to make their community a better place, and share those three things with others in an attempt to encourage them to do the same. Over a period of the last few months purple 3’s have been popping up all over the region, a small reminder of how each person can change their community by doing three simple things. Today, in an exciting landmark of this movement, 3 Day will be proclaimed in Wood Buffalo, a day to celebrate the concept of doing positive community-building things, whether large or small. 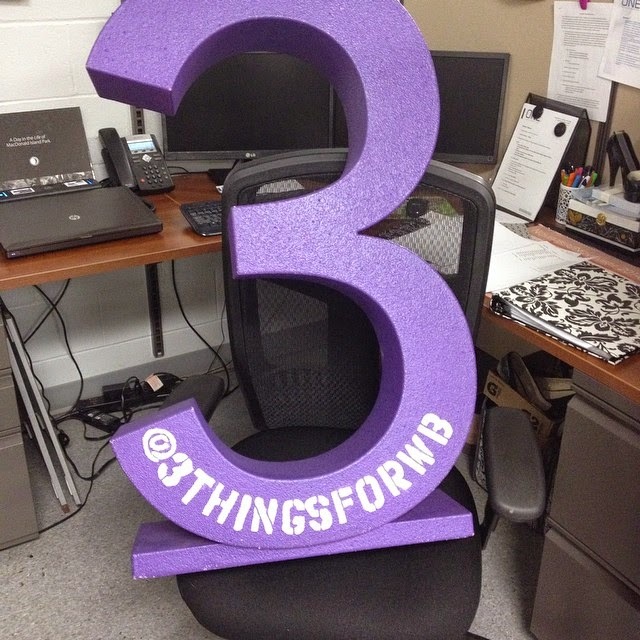 For awhile I shared my office with a large purple 3. Mister 3, as we called him, reminded me of my three things every day, prompting me to think about what I had done, could do or would do that day to make my community a better place. I am truly fortunate in that my very job is a commitment to that goal and that every day I believe I do things that help to make this a place where people want to live, work and play – but Mister 3 was a reminder that it did not stop at the doors of my office. Over the journey of the 3 some of my things have been simple, like mowing the strip of lawn I share with my neighbour (even though when they mow it they will often mow their portion and leave my strip of lawn – about 8 inches in width – untouched, but I digress and my only hope is that my effort of goodwill may encourage them as well) or shovelling their sidewalk. Sometimes it has been buying coffee for the person behind me at Starbucks, or simply picking up some trash that I did not drop. Some of my three things – as the three things have become a weekly habit now – have been larger, but done in secret and not likely to be shared as some of the best good deeds are done anonymously and without anyone ever knowing how they were accomplished. And over the course of the journey of the purple 3 I have been the recipient of good deeds, too. My garbage bins are somehow always returned to their proper place after garbage collection, although I am rarely the one to put them there and I have no idea who does or has been doing so for months. I have found small gifts waiting for me on my doorstep, with no card attached, and I have been the grateful recipient of everything from gifts of cupcakes to flowers. Small things, perhaps, but important things, nice things. community-warming things. Community is not built by government or organizations, not by politicians or business leaders. Community is built by those who live in it, and those who do three things not just as part of their job but as part of their everyday lives. Community is built by people who do three things – or six things, or 9 things, or an endless string of things – for others with no other goal than making other people happy and their community a place where people smile. Today in honour of 3 Day I donned my favourite purple heels, my purple blazer and my purple purse (three things, you see, a number that has caught on in my head as it is a “just right number”, more than two but less than several). And on the drive to work I thought about my three things this week and devised a small plan to do something nice for someone else who will never know who did it, or why, and may not even understand the significance of a purple 3 – but it doesn’t matter, because that purple 3 has become my touchstone and reminder of doing Three Things for Wood Buffalo – and maybe even a few more.